Parched, much like our plants at this time of the year, hitting a dry spell can be difficult to handle. I am referring to my writing so instead of a dedicated one-topic blog this beautiful Monday morning, there is a list of fast and furious thoughts to get out there to my gardening kin. And for those of you who haven’t noticed, it is the first official day of summer. Yahoo! And while you are in the veggie garden, if you planted garlic last fall, check for the seedpods starting to sprout. 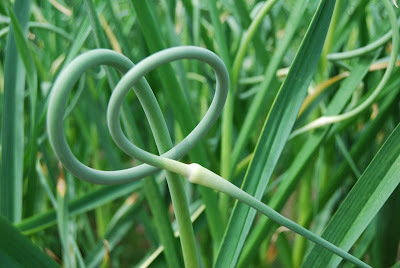 Known as ‘garlic scapes’, these pods are coming out a tad early this year; just like everything else in the garden. They usually form in July but in our garlic patch, there are some varieties already displaying their wears. Remove these pods when they are young and tender to use them for salads, soups, or sauté them for vegetable dishes. This little technique also helps put the energy into forming the garlic bulb. While there are many plants growing at record pace in the veggie garden, our perennials are also ahead of schedule. So don’t forget their existence in the landscape. There may be some perennials you forgot were there and for that matter, even liked when they first got plopped in the ground. It takes time for things to come into their own as plants mature and develop so pay attention to new combinations and perennials that bored you last year. You may see them in a new perspective. While on the note of ornamentals, the official planting season (i.e., Nurseryman standards) for woody plants is wrapping up. Within in another six to eight weeks, these trees and shrubs are already preparing for next season. They will be forming their buds and storing food for the upcoming winter. If you intend on planting woody shrubs in the next few weeks, plan accordingly for appropriate aftercare. Water is the key element. Remember, we all get parched! So enough with the technicalities and get out and enjoy the first official day of summer. Today’s inspirational quote is brought to us by Phillip Scherrer. “To the best of our knowledge, our Sun is the only star proven to grow vegetables.” But then again, we are all-stars in our gardens! P.S. 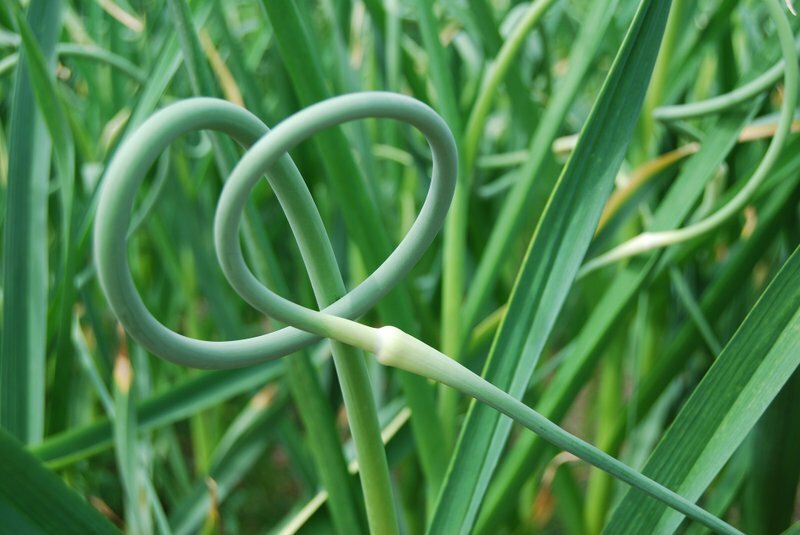 Image of garlic scapes from the Internet. Cool, sculptural and tasty! Who can live without garlic?